In June and July 2009, we participated in the Ne ‘Na Artist Residency program in Northern Thailand. Situated on the outskirts of Chiangmai lies Monfai, a project piloted by Rampad Kothkeow, a local woman with aspirations to preserve the traditions and culture of the Lanna people. Peeking above the canopy and immersed in the undergrowth are the rooftops of a series of traditional buildings and houses distinct to Lanna culture and identifiable by ‘ka-lae’, a hand carved wooden V shape. Over a period of twenty years Rampad has ‘collected’ these traditional Lanna structures and created an open-air living museum, using them to preserve and educate others about the disappearing traditional Lanna culture. The teak buildings whilst humble and practical in appearance are spotted with intricate woodcarvings which upon closer inspection reflect the customs and beliefs of the Lanna people; the interesting blend of belief and function that emphasizes the search for balance between the aesthetic and the pragmatic. Monfai, which translates as ”view from cotton hills”, communicates both the traditional Lanna perspective and the traditions Northern Thailand is renowned for; the cotton industry, textiles and weaving. One cannot help but be besieged by the architecture at Monfai as you wander beneath and throughout the labyrinth of paths it creates as it takes form within the surrounding vegetation. You will often find trees have been incorporated into the structures as improvised pillars. The series of buildings comprising the whole complex exudes an unusual coolness that is as comforting as the shade of a banana palm on a hot tropical afternoon. Some even find it mysterious as if it were harboring old spirits of previous occupants. But the entirety of Monfai can never be experienced all at once, rather only through its parts, through the series of exhibition rooms, sheltered areas, decks, passageways and stairs. 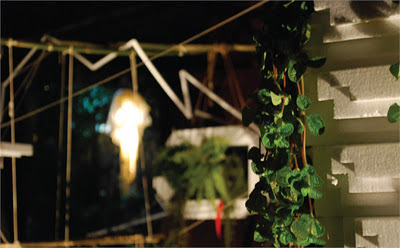 Hanging Altar is a response piece to our experiences at Monfai. In trying to communicate our impressions and observations of the entirety of Monfai, we built a small-scale replica of Monfai to give an omniscient perspective to the complex of rooms, passageways and stairs, which form its structures. 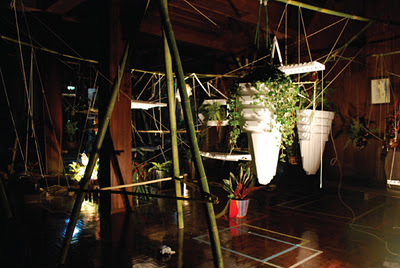 The installation utilizes a variety of native plants¬ and processed materials including foam, colored paper and fish tanks and the local knowledge of Northern Thai people to construct an elaborate hanging garden within the Monfai studio space, reflecting the immersive nature of the Monfai architecture in the surrounding environment and the utopian aspirations it embodies. The omniscient perspective serves as a gods eye view and performs a similar function to that of the altars in Ba’ila villages in southern Zambia. Ba’ila settlements are constructed and organized in recursive circular patterns and, according to ethnomathematician Ron Eglash, encompass mathematical principles of fractals whereby the chief’s ring at the back of the village is a small-scale replica of the entire village. In each domestic dwelling is an altar and the chief’s house serves as the ‘altar’ to the village. As the altars in both the domestic and chiefs quarters act as reminders of the higher powers they each serve, our small scale model of Monfai within Monfai is intended as a reminder for the visitors of the higher ideals and beliefs that Rampad aspires to and serves in the creation and ongoing development of Monfai, namely preserving the traditions and culture of the Lanna people. Thr fractal principles of social organization found in Southern Zambia inform the construction and understanding of many components of our work and reflect the myriad of features that compose Monfai as a self-organizing social organization serving grander schemes.